Sigma announced the price of their 30mm f/2.8 EX DN lens for mirrorless cameras - $280 (MSRP). Expect the street price to be lower - B&H is currently taking pre-orders for $199. 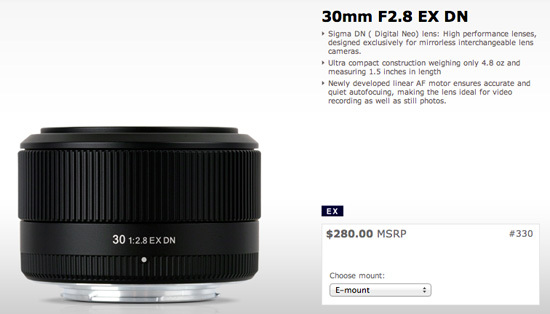 The Sigma 30mm f/2.8 EX DN lens was announced during CES and is available in E and m4/3 mounts. The price of the 19mm f/2.8 EX DN lens is not yet announced.